As I being to compose this race report, I’m daunted by the prospect of trying to summarize my race and thoughts surrounding the event. I guess that is fitting for a race that is in itself such a monumental task. Those that have read some of my other reports will know my tendencies. 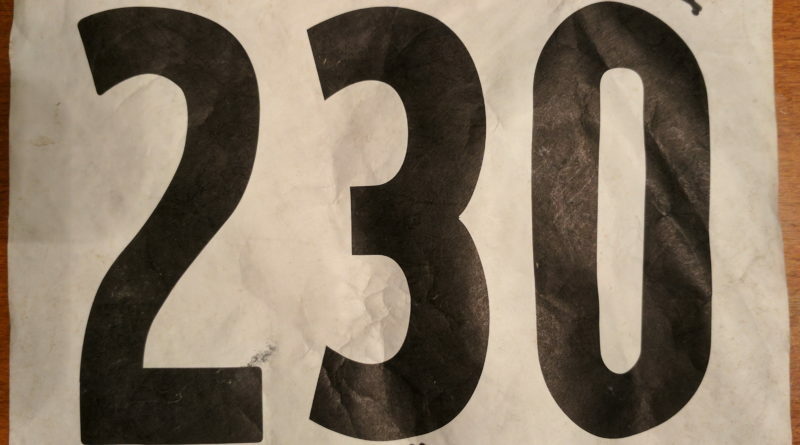 I can turn a 5k trail race into a short story and a marathon into a novel. 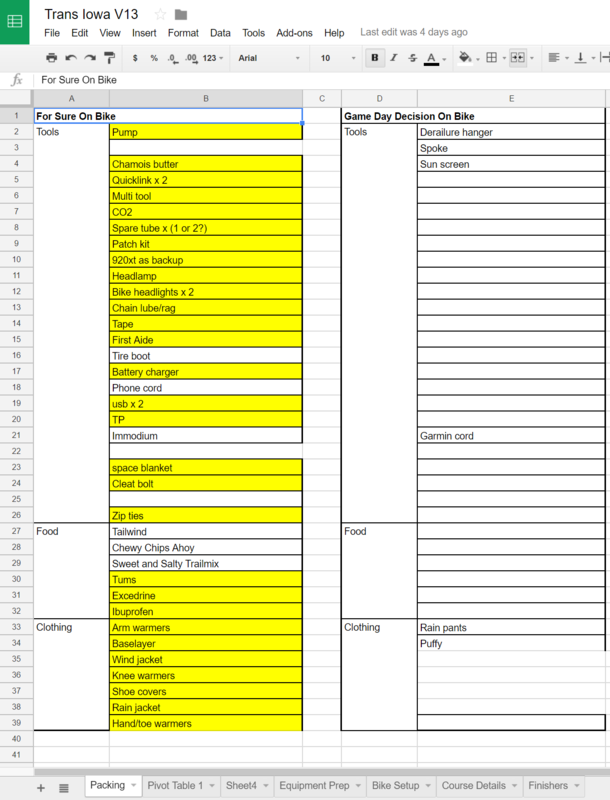 So in the interest of making some progress and breaking this thing down into manageable tasks, I’m going to have to serialize this one. Just like breaking the preparations for the race into components or looking just as far ahead as the end of the cue sheet, or to the next check point, this seems the only way to attempt this. Besides, if it works for Guitar Ted to spend a week recapping, the model is pretty sound. Following the concept of from check point to check point, I think the race check point will make good points to break up this report. So part 1 will be the prelude to the event and the start of the event to check point 1. Part 2 will be the heart of the event between CP1 and CP2. We will conclude the trilogy with from CP3 to (spoiler alert) the DNF and the aftermath. In case you need the super primer, as in what is Trans Iowa, or TIv13, better head on over to the Trans Iowa page and check out the FAQ. As it turns out, the very first question is, “What is Trans Iowa”. Friday morning began with final packing of the car. I had been making lists for two months so I had felt pretty good about not forgetting too much stuff. It did feel a bit odd to have a 50 pound (not really, but it was heavy) basket full of all of my bike clothes, gear, and equipment, and a nearly empty duffel bag of normal clothes. But when you plan to spend the majority of your weekend away with just you and your bike you really don’t need much else. 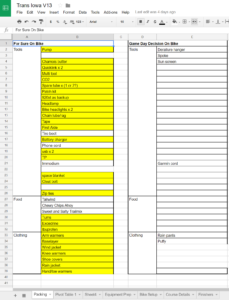 Packing lists were predominantly focused on the bike. Despite my preparations, I still needed to do some panic shopping on the way down on Friday. I had failed to purchase a derailleur hanger. Unfortunately my local bike shop CyclovaXC didn’t have any on hand. Thankfully Angry Catfish in Minneapolis did. While there I also purchased some “water proof” gloves. I knew that the gloves I did have didn’t fair well in wet weather. The weather showed that it was pretty much a guarantee that I was going to spend a good portion of 34 hours in wet 35-40 degree weather. I figured I should risk going against the “don’t do anything new on race day” mantra. After the drive down to Grinnell which included a little nap, Starr and I checked into “our” (really her’s for all the time I was going to get to use it) hotel room. It was a quick stop to bring everything in and then we headed over to the Grinnell Steak House for the pre-race Meat-up. With a little confusion in the instructions, and a little anxiety from the nightmares about missing key details earlier in the week, we showed up a tad early. I got to be the first one to sign the waivers and the media release form. Anxious riders, their support (rescue) crews, and volunteers eating and socializing at the prerace Meat-up. Being the introvert I am and not really knowing more than one or two other people this was a bit of a strained time for me personally. 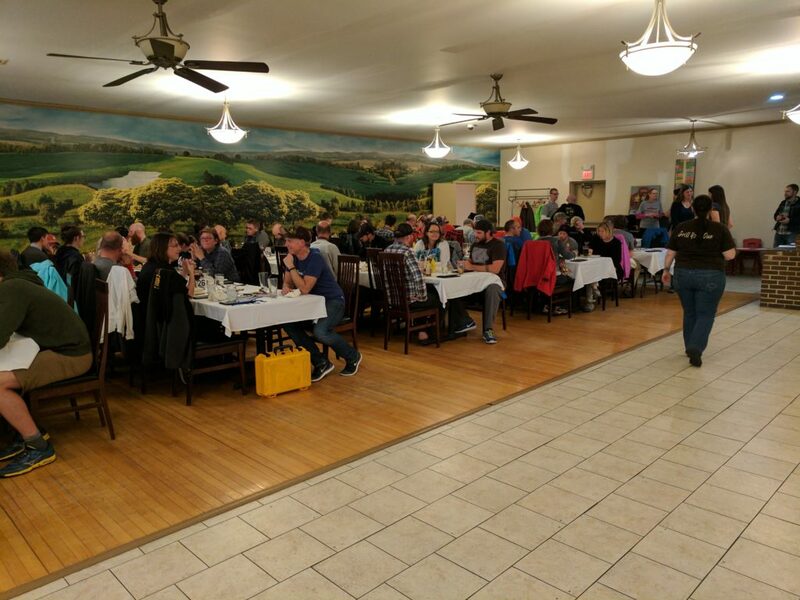 While I really wanted it to be a fun social affair, we chatted with a few folks, but otherwise mostly enjoyed the great food and nervously watched the nervous energy around us. Guitar Ted (r) and sponsor WTB’s Will Ritchie (l). Eventually it was time for the real meeting part of the Meat-up to begin. Guitar Ted gave some words, there were many rounds of enthusiastic applause for the volunteers, the sponsors, and for Guitar Ted himself. I honestly don’t remember much of the specifics of what was said. Obviously the “you are responsible for you” bit, be careful at road crossings, etc. 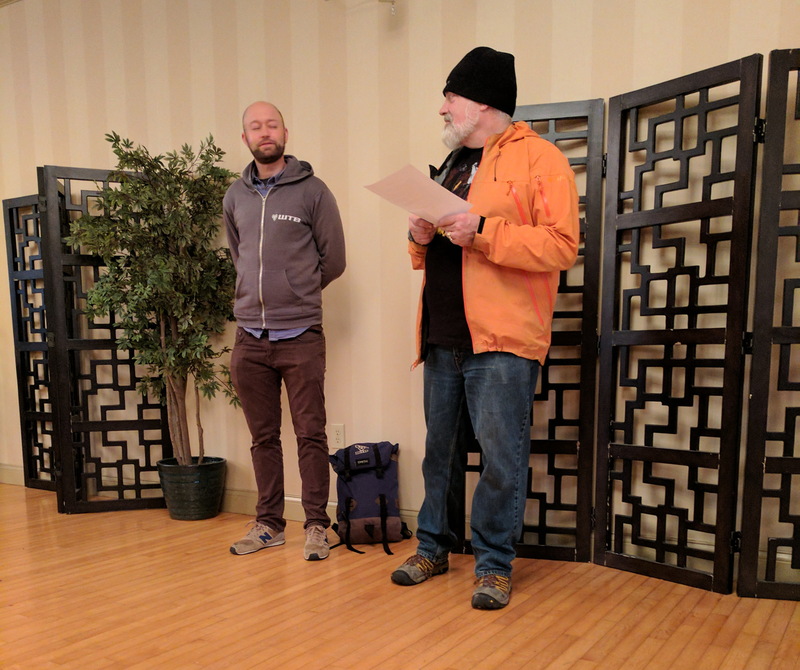 Eventually we were called up to receive our cue sheets and shortly thereafter the meeting adjourned. 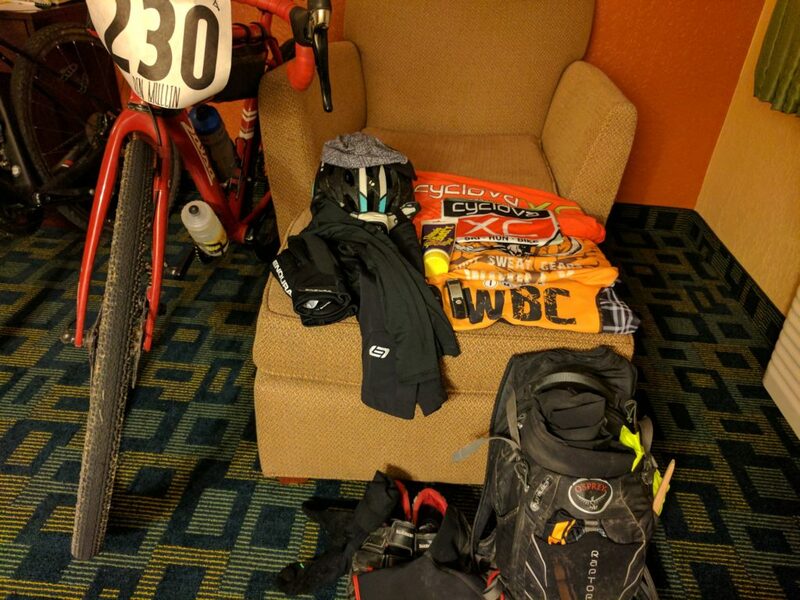 From there it was back to the hotel to finish setting up the bike and laying out all of the clothes and food. I was pretty well sorted on what I was bringing it was just a matter of deciding where it should all go. With all of my prep rides and list making, I had a pretty good idea already though so it really didn’t take me too long. I think I was in bed easily by 10pm with 2:30, 2:45, and 3:00 alarms set. With the nightmares earlier about missing various parts of the event I didn’t want to accidentally shut my alarm off. Flat TI Ben and a fully loaded Warbird. As it turns out I slept pretty well actually. I heard plenty of fellow riders talking about not sleeping at all that night. 10-2:30 isn’t enough sleep, but sleep it was. I chugged some pretty nasty hotel room coffee and a Kind bar while I dressed and pretty soon we were heading out of the hotel and into the darkness towards the start. The rider and steed ready to do battle. 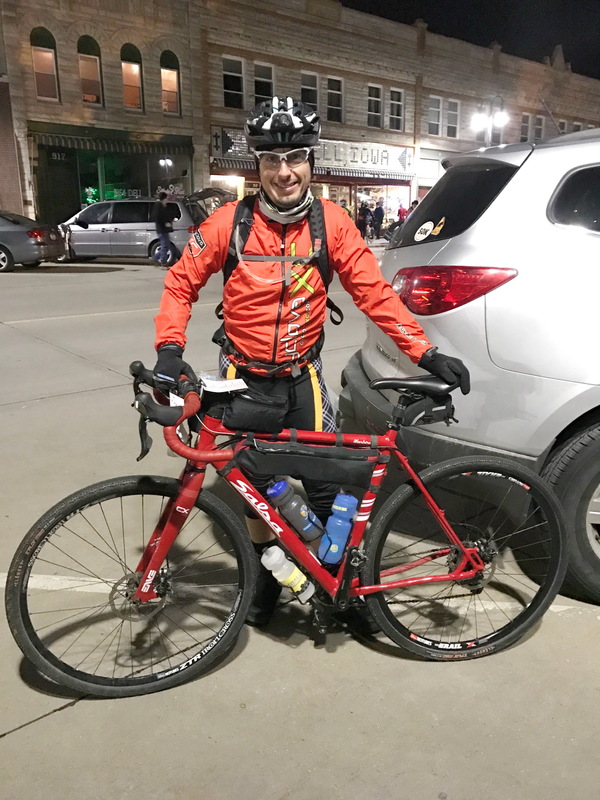 As 3:30 am rolled through to 3:45 am, Broad Street in Grinnell filled with anxious cyclists and probably equally anxious support crew. The temperature was around 40. On the street the winds were calm and no precipitation was falling. Everyone knew though that it was only going to be a matter of time before the rains came. The only question was how far were you going to be down the course when it happened. From what I saw, I was one of only maybe two or three riders who opted to show a little leg at the start. I knew that 40 degrees was plenty warm for me to be riding around with just knee warmers so long as it was dry. In fact, I was a little concerned I was going to overheat with all of the layers on top. Sure enough, by mile 10 I had to stop to strip a layer. Riders gather in front of Guitar Ted moments before the start of TIv13. Promptly at 4:00 am, the horn was sounded and 76 of us were off and rolling for what would hopefully be 331 miles. I immediately felt a bit uncomfortable. Not so much from the pace, but from being around a bunch of cyclists in the dark. My new gloves were comfortable, but left a somewhat vague feeling in my steering. I drifted somewhere mid-pack I would guess as we navigated the paved streets of Grinnell in darkness. Once we hit the gravel and the what I can only assume were open fields, the wind showed its force for the first time that day. We were headed east and the wind was firmly blowing out of the north east. I immediately felt unsteady on the bike and dialed it back a notch to just settle in and get comfortable. I knew I wasn’t going to be able to ride that tense for long. 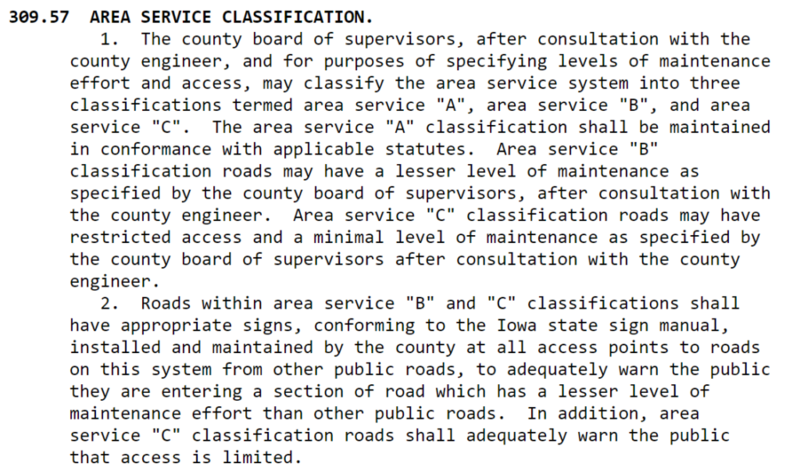 Statute definition of a B classification road in Iowa. There are horror stories told of these things. 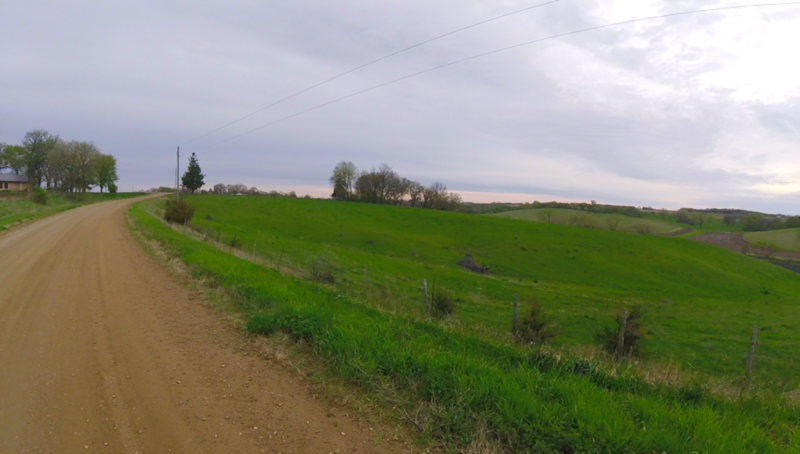 Prior to an experience on a local Minnesota MMR (minimum maintenance road) this spring, I thought these stories were just told to scare the novice gravel rider away. 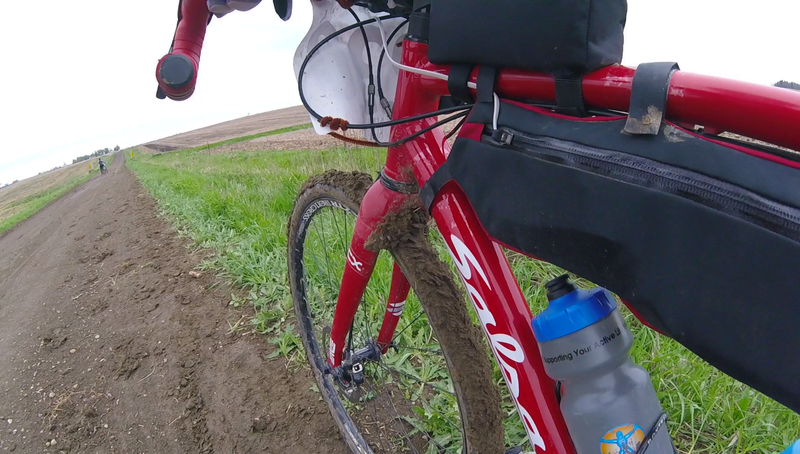 “Mud clearance” was just another gimmick to try and sell you a new bike. Mile 14 of TIv13 brought us to our first B road. 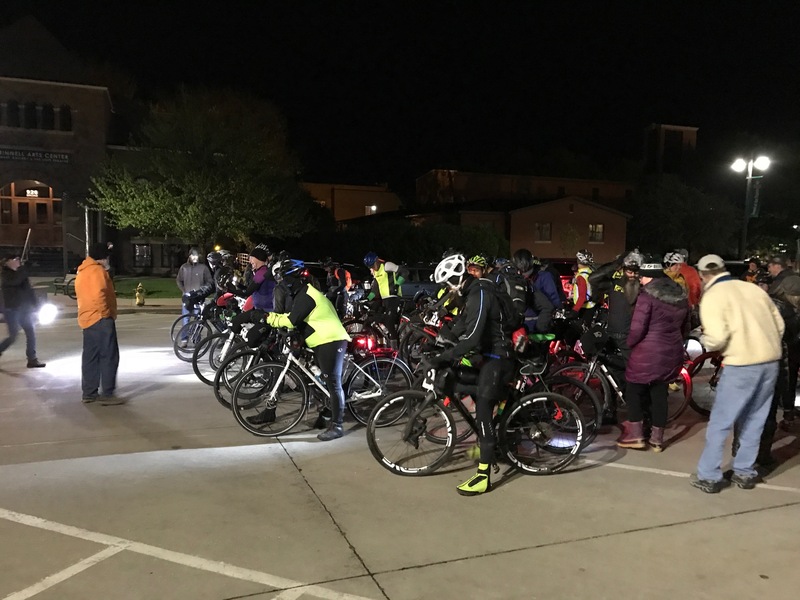 Riders that had become quite strung out on the course were rapidly bunching up again as people were dismounting their bikes in the dark. My first few steps on the road found it to be fairly firm with just a little squirmy feeling on the top. I was almost tempted to ride it. And then my wheels packed with mud and stopped turning. Just like that. I’m not sure what the soil composition is, but it behaves very much like a combination of potters clay and wet snowball snow. Once it starts picking up on something it just collects just like rolling a snowball for a snowman. And then it packs just as thick and dense as potters clay. It is some really nasty stuff. 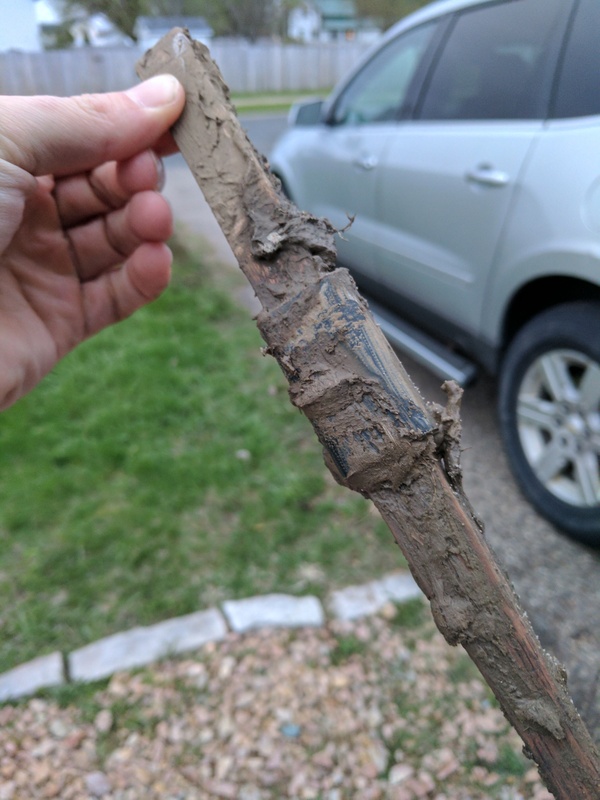 An example of the wheel clogging B road mud found on the second B road of the course. This was similar to the first road as it had not started raining yet. I tried the walking in the ditch mode of B road transport and it worked some, but my tires still eventually clogged enough they wouldn’t roll. So I resorted to the carrying the bike on my back mode of transport. Considering my bike was still essentially fully loaded and now had 10 pounds of mud on it, this was no easy feat. On my trek I picked up a dropped set of cue sheets. A few minutes later I was able to return them to their owner. I figured it was just us riders out here and we needed to look after each other. If I dropped something I sure hoped someone else would pick it up behind me. As we exited that first mile stretch of B road I had the opportunity to use my TI Shank™. TI Vetran Ben Oney had imparted the wisdom of carrying a stick with me to clean my bike and my cleats. The night before leaving for Grinnell I rooted around in the shop to find a suitable stick. I found something close and tapered either end down. One end was flat and wider, the other a bit pointier and around the middle I wrapped my couple of feet of emergency gorilla tape. The BTMski TI Shank™ Patent Pending… but seriously, its a pointy stick and is a must have. With my stick I was able to squeegee the majority of the mud off of my tires and then scoop the muck out of my SPD cleats. I’ve seen pictures and heard reports from many riders since the event that were unable to clip back in to their pedals after the first hike. After that first B road, the sun started to rise and it was spectacular. 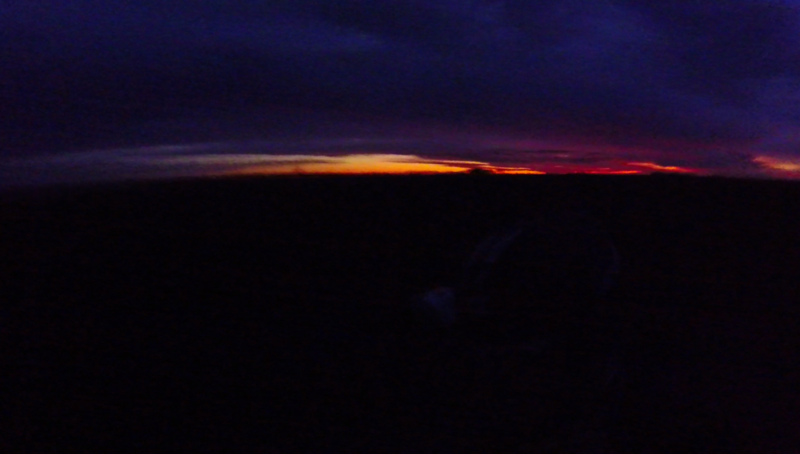 Sunrise on day 1 of TIv13. As Guitar Ted has stated in his summary, the “Red sky at night, sailors delight, red sky in morning, sailors take warning” was definitely running through my head. But in the meantime I was able to start shutting the lights off and seeing the countryside I was rolling through. 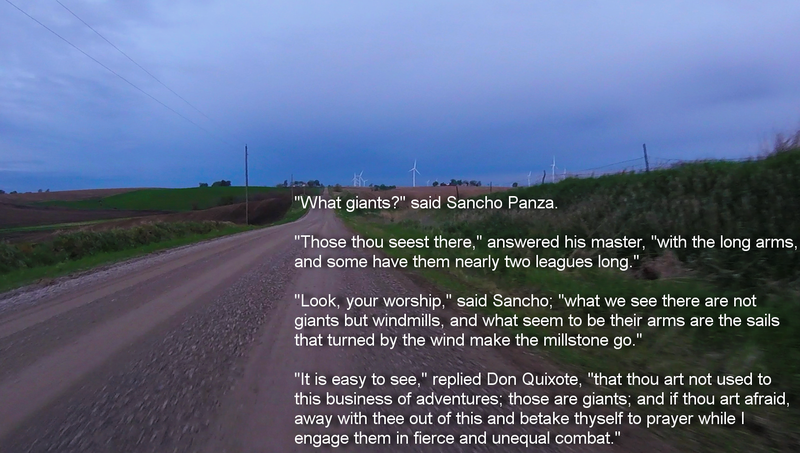 Having been led to a quote from Don Quixote in the days prior to the event, I had a certain affinity for windmills. So as we were blown along ever more westward, I was thrilled to find a nice selection of Giants with which to engage in combat. It couldn’t help but smile as I rode past. The remainder of the ride to check point one was pretty uneventful. I spent the majority of the time riding by myself. Occasionally passing a rider or being passed, but never sticking with anyone. I was perfectly content to find my own pace in the early goings and with the majority of a tailwind it wasn’t as critical to find someone to share the work with. Some beautiful rolling Iowa countryside. I rolled into check point one at 7:45 am after 3:45 on the bike. This was 30 minutes to spare to the cut-off after averaging 12.3 mph. For the most part I was feeling pretty good still. Just a few aches and pains and a need to reapply some chamois butter. 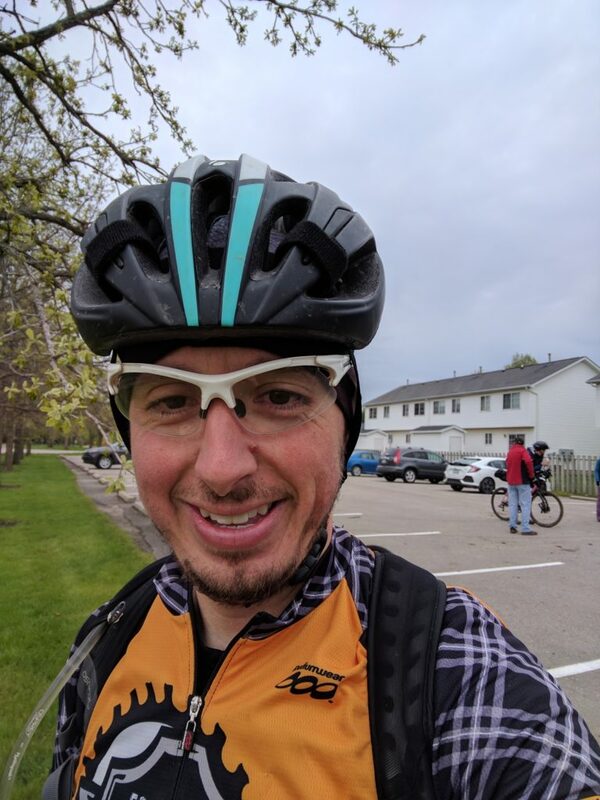 The check point workers pointed me to the local grocery store, but despite Guitar Ted’s warnings of always stopping when you had the chance, I was well laden for an extended push on the bike without a stop. There for after just a short equipment shuffle to get some lights recharging and the chamois butter application I was rolling again in ten minutes with a fresh set of cue sheets and 193 mile to go to check point 2. Still smiling at check point 1. Love this, Ben! Takes me right back into those early moments. Will definitely be carrying a stick with me the next time around. Great shot of the sunrise, too. Can’t wait for the second installment.